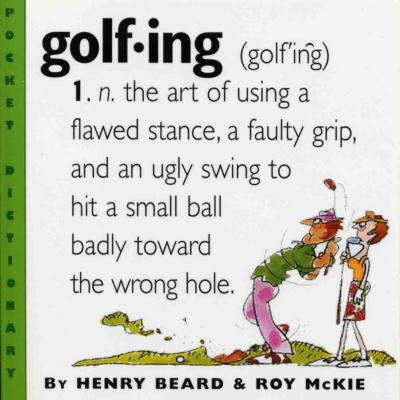 Two of the funniest books ever published on their respective subjects - SAILING and GOLFING - are back. And better than ever. Repackaged in the irresistibly chunky, compulsively readable small square book format, each is a perfect gift for a new generation of obsessives. 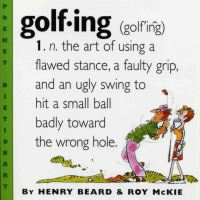 GOLFING is even funnier than when it was originally published. Now an avid golfer, Henry Beard brings the same passion for improvement to writing about golf as he does to playing it, and he's both added new definitions and rewritten many others. Like whiff - "Familiar term widely misused to describe particularly fast and powerful style of practice swing intentionally made directly over the ball." A classic, SAILING is "...quite simply the funniest book I have ever read" - William F. Buckley Jr. From ahoy - "The first in a series of four-letter words commonly exchanged by skippers as their boats approach each other" to zephyr - "A warm, pleasant breeze named after the mythical Greed god of wishful thinking, false hopes and unreliable forecasts" - it brings new meaning to the things said at sea.